For the first "Teacher Tuesday" of the 2018-19 school year, we catch up with Luke Yehlen, the educator working to make math fun. Chat with almost any Upper School student this year, and ask them about their favorite class. More often than not, Mr. Yehlen’s pre-calculus course gets a mention. Some might find it odd — for most teenagers, math doesn’t exactly top the list of things making them smile. But Luke Yehlen aims to do just that. That effort appears to be paying off — Yehlen’s positive rapport with the students is visible. Anytime he walks into the Dining Room during lunch or enters the stands at an athletic event, kids interrupt their own conversations to shout his name and wave across the room. 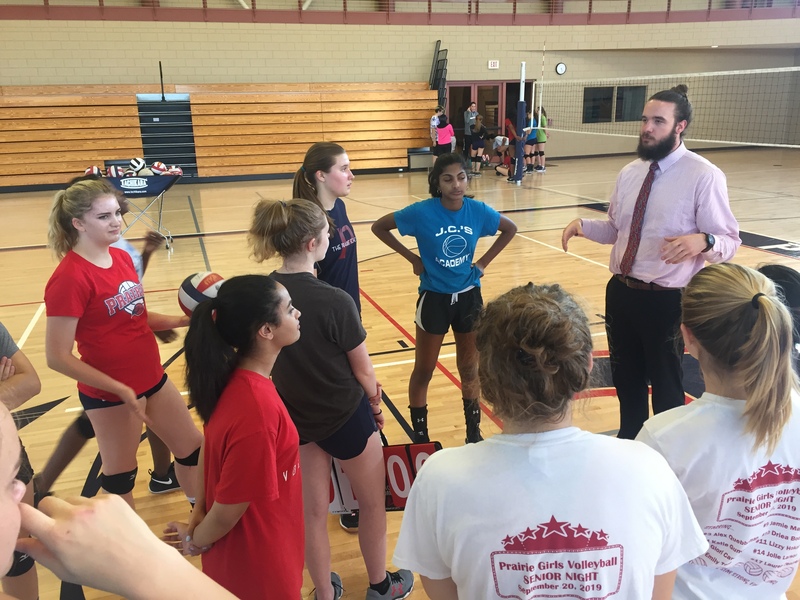 A few of Yehlen’s Upper School students hop in on his “interview” during volleyball practice. It certainly doesn’t hurt that Yehlen, in his mid-twenties, is relatively close in age to his students. Students cite Mr. Yehlen’s “man-bun” and interest in activities including hiking as some of the reasons they enjoy being around and learning from him. Yehlen says he sees his youth as a benefit in his classroom, rather than a setback. When did you realize you wanted to be a teacher? When did you start growing out your hair? What is your favorite thing about TPS? Did You Know: 2018 marks the fifth consecutive year that 100 percent of Prairie’s full-time faculty (including Mr. Yehlen!) made a gift to the Prairie Fund. Money raised through this initiative bolsters TPS’ budget, and provides crucial support for academics, arts, athletics, and co-curricular programming. Learn more and make YOUR gift by clicking here today!